Get a Free NatraGel Mask & Rooibos Calming Facial Mist With Purchase. Head into spring calm and cool with our March Special. One of the annoying symptoms of rosacea is the burning, flushed, hot face sensations add to that dryness especially after long winter months. While Rosadyn is helping you to treat your rosacea from the inside sometimes a little pampering on the outside is needed. As such, we are offering customers who purchase 6 or more bottles of Rosadyn a special Rosacea Skin Calm and Cool combo special. 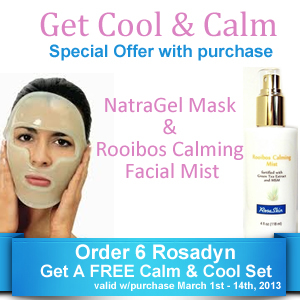 Order 6 bottles of Rosadyn and receive our FREE Calm and Cool Rosacea March Special . 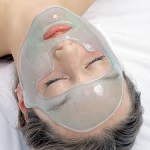 NatraGel™ face masks are a unique hydrogel system used to calm, cool, soothe, hydrate and moisturize your skin. Used by many in the cosmetic and dermatology fields after procedures the NatraGel™ Mask, cools and calms skin on contact and helps to reduce swelling. Extensive skin sensitivity tests have been conducted, and confirm that NatraGel is considered a “non-primary irritant” to the skin. NatraGel hydrogels have furthermore been the subject of rigorous safety and efficacy evaluations. Formulated to calm and hydrate rosacea sensitive skin. The mists redness reducing, anti- inflammatory effects are a natural benefit of Green Tea Leaf with added anti-fungal, anti-bacterial properties of the Rooibos plant. Your rosacea skin will love the Rooibos Calming Facial Mist’s cooling, moisturizing and calming effects. in the comment section when ordering to get the deal. 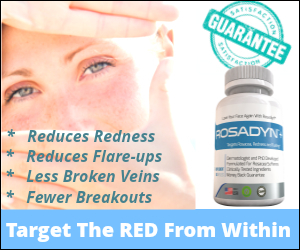 Keep in mind that in addition to these bonuses, every multiple bottle order of Rosadyn rosacea treatment is also automatically receiving a volume discount and free shipping for orders of 7 or more bottles too! So hurry and order today, this is a limited time offer! Valid only with minimum order of 6 bottles or more Rosadyn, ordered between March 1st – 14th, 2013. No cash or credit value offered in place of promotion offered, while supplies last. Disclaimer: As with any skincare product, exercise caution when using – if any redness or irritation occur, discontinue use of product.